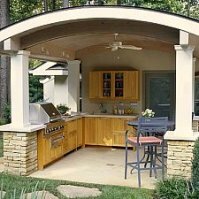 Good news about outdoor kitchen countertops! If too many options create decision making nightmares for you - you're in luck! There are very limited choices (at least good choices) when it comes to outdoor kitchen countertops. There are really only three ways to go here. And in my mind, one stands above the others, but you can decide that for your self. Concrete isn't just for your driveway anymore. In fact, concrete countertops look great, even for inside your house. 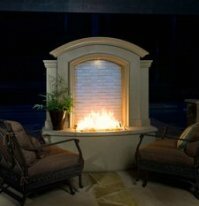 They are a great choice for outdoor kitchen countertops. Concrete countertops are cast in one piece in most applications, so there are no seams, no grout lines, and almost any shape is possible. And the look is very nice indeed. Colors are almost limitless, since the concrete is dyed when it is mixed. The color will tend to lighten several shades as the concrete completely cures, usually over a period of several months. As you can see here, various objects can be added to the concrete mix before it is poured, giving an aggregate appearance. You can even have an integral sink molded into your concrete countertop. There is some maintenance required, as there is with any of these choices you make. Concrete countertops need to be sealed and waxed periodically. 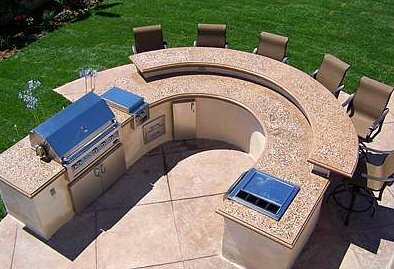 Thats a reasonable investment to make in a beautiful and durable outdoor kitchen countertop. 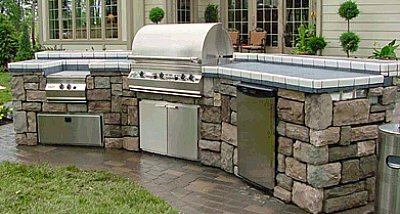 Tile is another alternative outdoor kitchen countertop material. Avoid ceramic tile, since when it chips, the base color of the tile shows through - usually a lovely shade of dull brown or dingy gray. Use porcelain tile instead - its color is solid completely through the tile. Tile offers an infinite array of colors and combinations, so finding just the look you're after isn't usually a problem. Tile is less durable than concrete or granite, but still holds up well to reasonable abuse. But when you use tile, you have to use grout and setting materials - therein lies the problem. "But doesn't the tile and grout in my bathroom have to hold up in heavy water conditions?" you may astutely ask. Well yes, it does. But unless you have some very serious heating problems, that water doesn't freeze overnight in the winter. Outside it can and will. That freezing can destroy grout and it can get between the tile and the setting material and loosen the tiles. So if you live in an area where it never freezes, tile should be just as good as anything else, right? Wrongo. Since this countertop will be outside, it will be in the area where all kinds of critters and bugs and things that go bump in the night will be prone to walk around on it. Those critters will invariably do some of the disgusting things that such critters do - right there on you grout. And grout is hard to clean, even after sealing. So for me, its a sanitation issue. I love tile, but I don't like it outside on a food preparation / cooking area. 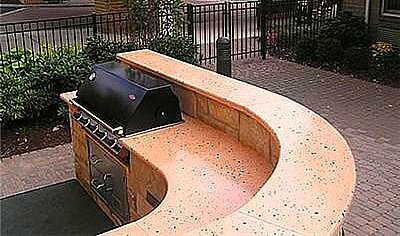 Granite is another material suitable for outdoor kitchen countertops. Granite is arguably the most beautiful of these options, and creates a very "high end" look. There are none of the grout or adhesive problems associated with tile. Depending on the size of the countertop, there may be a seam in a granite countertop, but they are so small and "groutless" that there is usually no problem. Some of the lighter colors of granite may tend to discolor over time in bright sunlight. Those lighter colors also tend to need more frequent sealing. Granite is also likely to be the most costly option discussed here, although there may be some cost overlap, depending on the specific products you choose. I suggest granite more strongly if it will be used in a covered area. 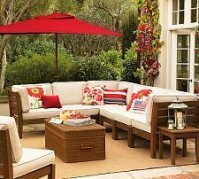 If your outdoor kitchen is exposed to direct sun, concrete may still be your best option. 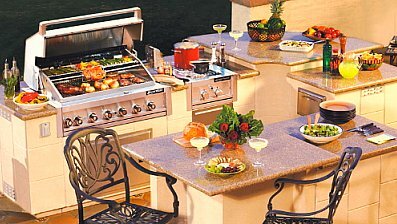 Choose wisely, install and maintain properly, and you should have many enjoyable years of service from your outdoor kitchen countertops. Yes, that is a concrete countertop below...with a glass aggregate added.